Far from the death reported after the Gov. Terry Branstad-led purge of the liberty wing from leadership positions within the Republican Party of Iowa, the Liberty movement in Iowa is alive and well. And, it remains a hard sell, especially as Iowans prepare for their first-in-the-nation caucus for the first time in a decade without U.S. Rep. Ron Paul. Last August, Cruz sat down with a handful of influential conservatarian activists in Ames to test the presidential waters. He fielded a wide variety of policy and strategy questions, but broke stride during a response on government spending to praise Paul and his followers, while taking a swipe at the suppression of Ron Paul delegates at the Republican National Convention in 2012. These recent moves, along with his dedication to hard-right policies in Washington, have already started to catch the eye of some of Iowa’s Liberty activists. Schultz, who calls Cruz a “rising star” in the party, started paying attention to the Texas senator during Cruz’s controversial not-quite-a-filibuster in 2013. He was impressed with what he saw. “It gave hope and energy to the base that somebody was speaking for them,” Schultz said of the 21-hour floor speech. 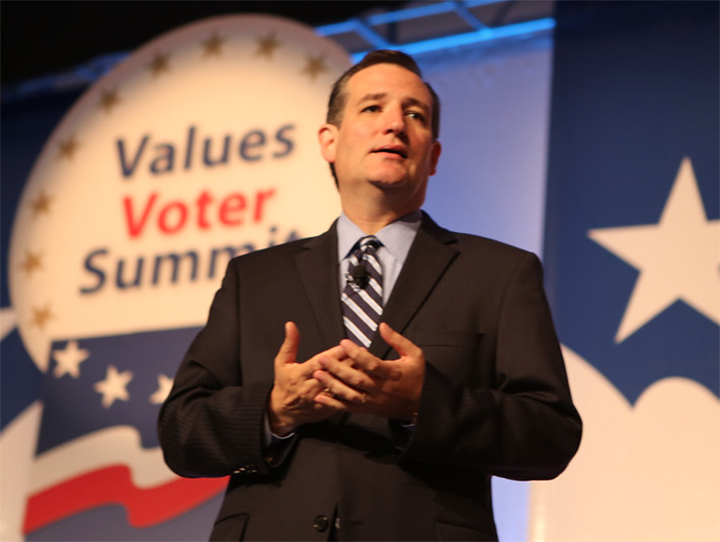 Other liberty activists registered a connection with Cruz based upon his opposition to Obamacare, Common Core, and Net Neutrality legislation. They are also supportive of his habitual opposition to increasing the size and scope of government, campaigns for which Team Cruz often utilizes trendy hashtag #makeDClisten. Liberty Iowa executive director Adil Khan thinks Cruz’s role in the government shutdown may actually help him woo Liberty activists, whose penchant for controversy and fierce opposition to government growth are becoming fashionable among millennial conservatives. He believes there could be interest in a Cruz candidacy within the Liberty movement, while acknowledging the fact Cruz will not start out with the immediate advantages of his Senate counterpart, Rand Paul. Still reveling in the unexpected victory of libertarian-leaning U.S. Rep. Rod Blum in what had been a heavily Democratic eastern Iowa district, the Liberty contingent is starting to have conversations about how much effort and energy should be poured into a presidential race. For as much as figures like Sen. Rand Paul, Rep. Justin Amash of Michigan, and others have helped mainstream the Ron Paul revolution, there remains some simmering resentment between the frequently-warring factions of the Iowa GOP – much of which is still directed at young libertarians who turned the party structure upside-down in 2012. Potential 2016 contenders will have to weigh the benefit of wooing liberty voters, against the cost of an association that many prominent Iowa Republicans – including Governor Branstad and Rep. Steve King – find troublesome. Compounding this risk is the fact that Ron Paul Republicans nationwide have earned a reputation as hard-line, skeptical, and often combative – though also intensely loyal to those they see as representing their ideals. State Sen. Jason Schultz, a 2012 Ron Paul backer, acknowledges, though it’s still too early for people to take sides, the Liberty movement is paying attention to the rapidly-expanding 2016 field. “Liberty folks are better informed, better engaged, and more mature political activists, in my experience, and I think they’re watching”, he said. Ron Paul, who retired from Congress in 2013 but continues to make his presence on the political landscape felt through his new network, will presumably pass his organizational structure and much of his rabid base of support on to his son, Sen. Rand Paul of Kentucky. But many folks in the first-in-the-nation caucus state think it may be a tougher handoff than many would surmise. Heather Stancil, Co-Chair of the Madison County GOP and a Ron Paul supporter in 2012, still has some reservations about a Rand Paul candidacy. She echoed widespread concern over the younger Paul’s endorsement of politicians that some see as hostile to the conservative base. “Rand seems too comfortable with those who compromise their principles,” she said. Kara Hadley, a central Iowa activist who identifies closely with the liberty wing of the party, is also concerned with some of Paul’s associations. With the apparent reluctance of many libertarian voters to “stand with Rand,” one would think that other 2016 hopefuls would be quick to court members of the Liberty movement, 25,000 of whom helped propel Ron Paul to a close third-place finish in the 2012 Iowa Caucuses. But that, too, may be a tall order for many candidates. Some are impressed with Cruz’s personal qualities. Not everyone, though, is sold on the Texas firebrand’s style. Former GOP State Central Committee member Tony Krebsbach, who manned the Rand Paul table at last year’s Family Leadership Summit in Ames, thinks that Cruz might struggle to appeal to some libertarians because of his tendency to cater more to mainline conservatives with his rhetoric. With regard to policy, he sees Rand as being the last stop for the traditionally-purist Liberty Movement. “The reasons that a lot of Ron Paul people don’t support Rand, would be the same reasons I think they would have a hard time supporting Ted Cruz,” he said. While acknowledging that Cruz would be his top candidate if Paul were not likely to run, Krebsbach finds Cruz’s style to be overly-abrasive, and questions whether such a style can appeal to Democrats and Independents who might otherwise be open to libertarian principles and policies. Others have similar concerns, worrying that the government shutdown, while inspiring the conservative base, might not have been effective at expanding that base by enticing independent voters into the GOP – something they see as a very positive component of Rand Paul’s electoral strategy. Some activists are also concerned that Cruz’s junior status – he is still serving his first term in the Senate – could dampen his appeal to some liberty voters who prefer a longer track record with which to vet candidates. But one thing is certain; those searching for distinctions between the two conservatarian champions will have the opportunity to find out more, as Cruz and Paul are certain to be a frequent presence in Iowa between now and the time each decides on a presidential run. Those in Ron Paul’s Liberty movement will, for the first time, face a choice with regard to the White House – and they plan to do their homework on Cruz.